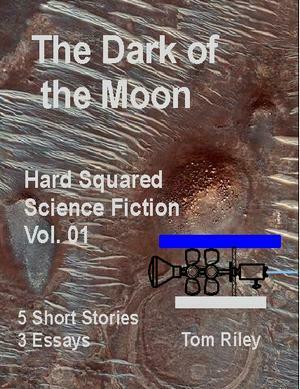 "Hard Squared Science Fiction Vol. 01"
Direct from Amazon.com in the Kindle edition. Or, from Smashwords in any of eight common electronic formats. America's vision for space exploration is currently very weak. The right move is to take action now and build a new grand vision for space. Historically, hard science fiction has been a critical tool to build just such visions. This e-book is a collection of five hard science fiction short stories plus several short essays on the technologies they demonstrate. Our stories are written specifically to build vision. The lead story about the importance of our time in the history of human space exploration and therefore in the history of the human species. Then comes a road trip across Mars as two artificial intelligences, a mother and daughter, drive a rover across the plains of the red planet on a rescue mission. Along the way they talk of what it is to be an AI and what love is. Then comes a series of three stories that are a first encounter tale set as a detective story in the film noir style. The series defines what the bare minimum one society can send through interstellar space and successfully establish their society around a new star. The concepts of big data, deep time, symbioses, persistence, and understanding are explored. Or, you can check out our Press Release as a downloadable .pdf file that you can send to anyone that you like. The complete essays from the e-book. "NASA's Strategic Direction and Design in the 21st Century" -- The notes for a talk on how to use 21st century design concepts to solve NASA's vision problem, in .pdf. "No More Terminators -- Living Wills for AI" -- Our entry for Creating the Future 2013 contest.